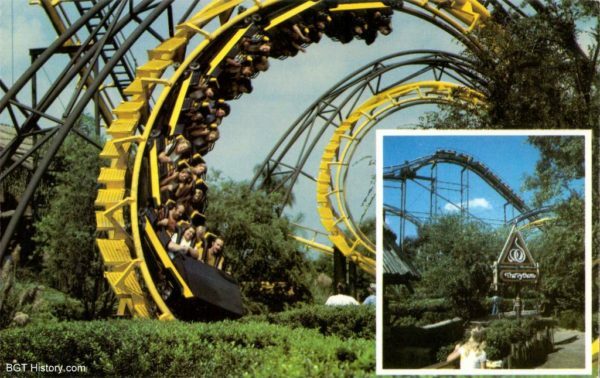 Python (often listed as The Python on signage and park advertising materials) was Busch Gardens’ first roller coaster, built in the Stanleyville section (later part of Congo and present day Jungala) in 1976. It operated for 30 years until it was closed and demolished to make way for Jungala in 2006. 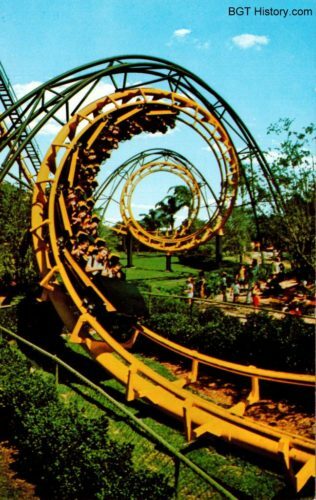 Python was manufactured by Arrow Development, and was one of the first steel coasters to take riders upside-down along its course. 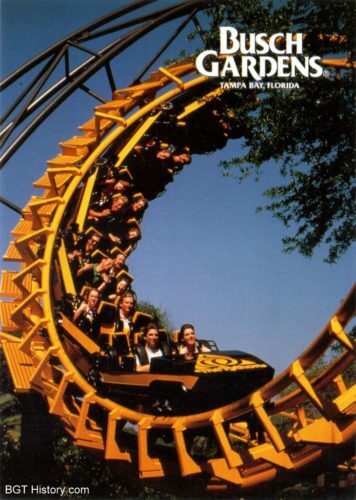 The corkscrew coaster was designed by Ron Toomer, who would also go on to design three of the roller coasters at Busch Gardens Tampa’s sister park in Williamsburg, Virginia (Loch Ness Monster, Big Bag Wolf, and Drachen Fire). Toomer would later become president of Arrow Dynamics, a successor company to Arrow Development. The maximum speed of Python was between 40 and 50 miles per hour according to different sources. Compared to more modern roller coasters, Python’s approximately 70 second ride time was relatively short. It’s highest point was between 70 and 75 feet according to different sources. The ride length also varies by sources – either 1,200 or 1,250 feet. 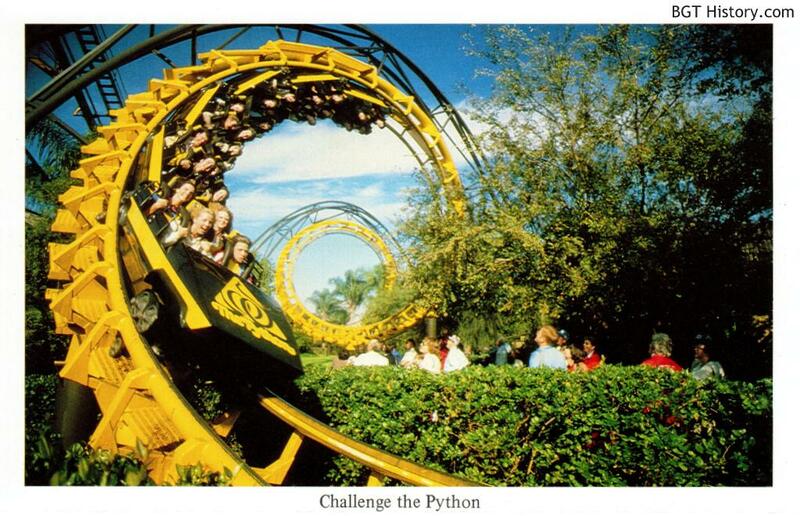 Upon its opening, the roller coaster was advertised with the tagline “I challenged the Python and lived.” The campaign had to be pulled several weeks later when a 39 year old guest with a preexisting heart condition died after riding Python. In 2003, Python was repainted, and the trains also received an updated logo, replacing the original. It was reported in mid-September 2006 that a demolition permit had been applied for by the park, but at the time the park would not confirm if Python was on the chopping block. By that point though, the park had confirmed there were plans to update the Congo area with new animal habitats, including for the tigers and likely for an orangutan displaced when SheiKra was built. Additional details and images on The Python will be added in the future.